Although LEF was catholic in its choices of writers, it broadly reflected the concerns of the Productivist left-wing of Constructivism. The editors were Osip Brik and Vladimir Mayakovsky: fittingly, one a Russian Formalist critic and one a poet and designer who helped compose the 1912 manifesto of Russian Futurists entitled, “A Slap in the Face of Public Taste”. 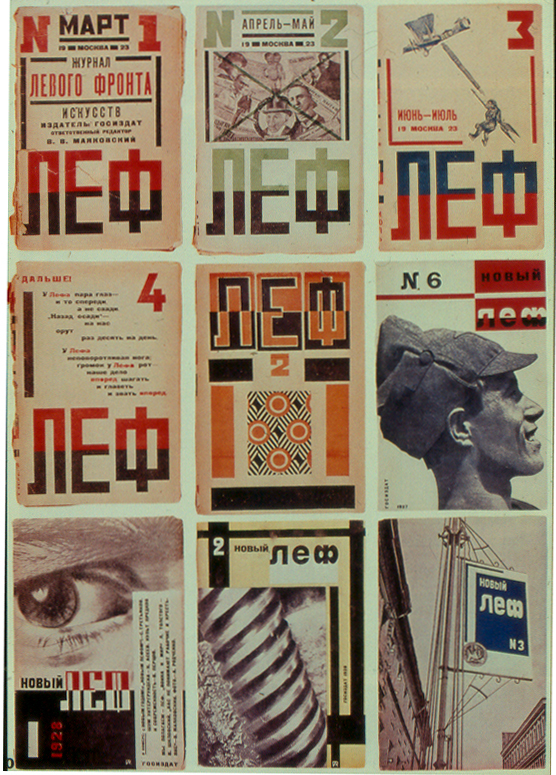 The covers were designed by Alexander Rodchenko, and featured photomontages early on, being followed by photographs in New LEF. Among the writings published in LEF for the first time were Mayakovsky’s long poem About This, and Sergei Eisenstein’s The Montage of Attractions, as well as more political and journalistic works like Isaac Babel’s Red Cavalry. The journal had funding from the state, and was discussed critically, but not unsympathetically by Leon Trotsky in Literature and Revolution (1924).